How Much Compensation Can I Claim For A Accident In A Restaurant? According to statistics released by Pragma Consulting, 31% of British people dine out at least once a week. With nearly a third of the country visiting one of the 70,000-plus restaurants in the country, there is an expectation of restaurant owners that the experience is safe and risk-free. Restaurant owners or operators are required to take ownership of operational procedures that ensure safety and security for the guests. The restaurant operators, by virtue of duty of care, must ensure that restaurant staff members and the guests are adequately protected from risk. This means not potentially exposing them to any kind of physical injury or illness. Often, mishaps or accidents take place on the restaurant premises and happen due to no fault of the staff members or guests. If you have been either a restaurant staff member or a guest and have been exposed to any such risk and have suffered injury or illness as a result, you may have a legal right to claim compensation. This guide offers useful advice on how to make a personal injury claim against the restaurant for physical injury or illness caused by accidents on the premises. A guide to restaurant accident and illness claims. What are personal injuries or illnesses caused by restaurants? Illnesses caused by substandard quality food and beverages. Slips or falls caused by slippery flooring. Slips or falls caused by poor railings, poor lighting, damaged floors, or damaged furniture. Other types of restaurant accidents causing injuries or illnesses. Claiming for restaurant accident and illness. Assessing the severity of a restaurant accident. The long-term effects of restaurant accidents. Restaurant accident and illness facts and statistics. What to do if you have suffered restaurant accident and illness. What can be claimed for after a restaurant accident? No win no fee restaurant accident and illness claims. How much can I claim for restaurant accident and illness claims. How to start a restaurant accident and illness claim. Why choose us as your claims service for restaurant accident and illness claim? Call for free advice and to start your claim. Any owner or operator of a restaurant is generally bound by a duty of care to their staff and guests. This means that the restaurant owner or operator has to take reasonable steps to ensure that all safety regulations have been properly observed, reducing the chances of a person being injured at a restaurant during normal operations. If the restaurant and its facilities are not adequately maintained, people may be exposed to the risk of accidents, injuries, or illnesses. In cases where the restaurant management has not properly implemented the health and safety regulations, visitors who are injured or ill may have a right to compensation. Illnesses caused by badly cooked food. Slips or falls on slippery floors which were not signposted. Falls caused by poor railings, poor lights, damaged floors, or damaged furniture. Burn accidents caused by overheated food. Physical injuries in a badly maintained car park or entrance. If you have suffered from any of the above issues, this guide will provide you with an introduction to making a restaurant injury claim. Even the finest restaurants in the UK can suffer from mistakes, accidents, and mishaps. Occasionally, such events may be liable for compensation. For example, if food is cooked with substandard or stale ingredients and is served to guests, the guests might suffer from food poisoning or other forms of stomach illnesses. Likewise, when certain recipes have not been prepared hygienically, the result may be sick guests or staff members. In other cases, bad quality liquor or beverages can cause the guests to get very sick. In any such event, restaurant negligence cases can be filed against the restaurant owner or operator, making the guilty parties liable to pay compensation to the victims. If the restaurant staff consume the same food and get sick, they may also be able to claim workplace accident compensation. Spillages of food and drinks are not uncommon in restaurants, especially in restaurants frequented by children and older diners. If the restaurant managers do not take enough precautionary measures to ensure that the cleaning staff are vigilant and continuously cleaning spills or breakages during the hours of operation, such incidents can easily lead to physical injuries to staff members and guests, possibly due to a slip, trip, or fall. In cases such as this, the restaurant operator can be held liable and made to pay compensation to the victim of the fall. There can be many reasons as to why an accident might occur in a restaurant. For one, many restaurants use décor lighting to provide a sense of ambience, resulting in poor visibility. In such situations, busy staff members carrying food or careless guests can easily fall and suffer serious physical injuries. When restaurant operators do not properly maintain the premises, broken furniture, broken railings, or damaged floors can also cause serious accidents. Often, such accidents can lead to legal action against the restaurant owner or operator. For example, in the event that you have suffered from a chipped tooth at a restaurant or other public premises, you may have a claim for compensation. Legally, being able to prove the restaurant operator acted in a negligent manner can mean that you are compensated for the injury and the costs it has brought. A restaurant compensation claim is not limited to the above examples. As well as slips and falls, poor lighting, and substandard food, you may be able to claim compensation for other accidents. Indeed, there have been cases of restaurant guests who made a claim against a restaurant for serving overheated food. Once the guest tried to eat the food, the high temperature caused burn injuries. Even hot food that is not consumed can cause serious accidents. Hot food spillages can hurt both the restaurant staff and the guests. The restaurant operators are not only responsible for maintaining the health and safety standards of the premises, but also the areas immediately outside. For example, if a poorly designed or poorly lit car park causes an accident during night-time operation, the affected restaurant guest may be able to take legal action against the restaurant. In all the above cases, assessing a particular incident and determining liability can be difficult. Staff members, restaurant owners, and even private landlords may all share in the responsibility. Liability, then, will vary from case to case. This is one of the reasons why it can be so helpful to work with legal experts when pursuing a claim. Given how complicated restaurant personal injury claims can be, having professional assistance to help you determine potential liability can simplify the process. The issue of liability is one of the trickiest parts of any compensation claim. In matters involving restaurants, this can become even more complicated. The potentially liable parties might include the restaurant operator, the staff members, the guests, the food suppliers, the landlord of the building (if it is rented), and even the local council. In situations such as this, trying to finalise a restaurant injury settlement might seem impossible. Essentially, the process of making a compensation claim will be about attempting to determine liability. If you have had an accident, it might be that the restaurant operator was liable, due to a negligent enforcement of health and safety standards. 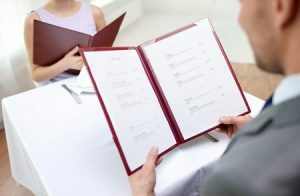 As well as the Health and Safety Executive, restaurants will also be in communication with the Food Standards Agency. The FSA governs the laws and regulations which apply to businesses serving food in the UK. Their website provides a wealth of information relating to this. If you have suffered from an accident which contravenes one of their regulations, for example, you might be able to claim compensation from the restaurant. In cases such as this, having trained legal experts to help you can prove to be incredibly useful. The UK Government has made details about food hygiene available to the public. One of the driving forces behind any compensation payout will be the severity of the injury. As we will see in a subsequent section, the severity of the injury will play a large role in determining the final compensation amount, which is why it is so important to fully understand any injury, illness, or health concern. For restaurant guests who have had an accident which they believe was not their fault, these injuries or illnesses could manifest in many different ways. Food poisoning, for instance, can range in severity. It can be an issue which passes in a day or one which causes issues for days, weeks, and potentially even months. Aside from the initial health problems, long-term and dormant effects of any such issues can be complicated. If you want to be certain that you are claiming the proper amount of compensation, it can help to have a full medical assessment as soon as possible. This is why we provide our clients with a local evaluation. We arrange for an appointment with a doctor close to you. Not only does this help your recovery, but it can provide a documented breakdown of the severity of the issue, including long-term implications and complications. If you would like to hear more about this, feel free to contact our team today. As mentioned in a previous section, the long-term implications of any accident can be varied and important in equal measure. Determining the full severity and long-term impact of an issue such as food poisoning or a broken arm may form a key part of your compensation claim. Given that the medical expenses (and others) of an undiagnosed long-term issue can be huge, it’s important to determine this early in the claims process. But long-term effects are not purely physical. When claiming compensation, it is always important to consider the ways in which an injury or illness can affect your psychological well-being, your quality of life, and your emotional wellness. All of these can be impacted in the future and they can be hard to quantify in a purely financial sense. Visiting a doctor to help diagnose such issues is always advised. According to data released by the Health and Safety Executive (HSE), around 35% of all reported injuries to workers in restaurants happen as the result of slips or falls. Between 2007 and 2008, the HSE recorded 4,000 accidents involving hotel and restaurant industry employees. A quarter of these accidents have been classified as “minor injuries”, leading to absenteeism over three days. Regulations like the Workplace (Health, Safety, and Welfare) Regulations 1992 have been created to ensure that an errant restaurant owner or operator must pay compensation to staff involved in a restaurant accident, focusing on preserving employees’ rights in the workplace. According to Accident Claims in Restaurants, the most common restaurant mishaps are related to slips, food poisoning, hot food, and beverages, causing injury to restaurant staff and guests alike. Finding a common basis for a compensation claim can be useful. For instance, our company has a long history of dealing with such claims. If you find that you have been a party to any of the above issues, you can trust our team to help you. Have you had a burn injury in a restaurant? If you have had a burn injury in a Restaurant find out if you can claim compensation today call our free phone number or contact us on our live chat we will give you the best advice and let you know if you can claim compensation for your burn injuries. Get immediate medical help for any health issues. Document and collect any medical records, x-rays, and doctor’s notes you are given. Take a photograph of both your injuries and the scene of the accident, if possible. Detail every expense that has occurred as the result of your accident, keeping receipts and invoices. Once you have done this (and once you feel well enough to proceed), you can begin to think about legal action. As such, the final step which we recommend is discussing the case with a solicitor. If you are curious about the benefits of working with a legal expert, we will discuss this in a later section. Medical expenses – Any expense that you had incurred because of the injury or illness can be claimed from the owner of the restaurant. This can include equipment, medicine, and visits to specialists that are not covered by public healthcare. Transportation expenses – If you have been injured and need to make frequent doctor visits, the cost of train fare or petrol can be recovered. Punitive damages for psychological trauma – Trauma due to the accident can have lasting effects on your mental well-being. As the trauma is difficult to quantify, a legal expert will ensure that, if you win the case, you are also compensated for the mental anguish you had to undergo while recuperating from injuries. Expenses for post-treatment rehabilitation – Injuries – physical or mental – may force you to go for post-treatment rehabilitation. All the expenses for undergoing such programs can be claimed in your personal injury claim against the restaurant. Long-term care expenses – If you had to hire a nurse or personal help, you can claim the cost of this back as part of your compensation. There are many other ways in which you can be compensated for your injury or illness. Discussing your claim with a law firm can help to establish every single factor and can ensure that your claim provides total coverage for your injuries. We offer clients a ‘No Win No Fee’ way to handle their case. This Conditional Fee Agreement (CFA) provides a simple and easy way of dealing with your legal case. It can help you put aside the stress and the worry of fighting for compensation and allow a team to help you, whilst at the same time reducing the financial risk of bringing in expert help. If you’d like to find out more, you can talk to our team at any time. Each accident case is unique and judged on its own merits. The pay table provided here indicates average compensation pay rates for injuries such as those you might suffer after a restaurant-related injury. The actual compensation pay rates may vary on a case-to-case basis and, thus, the table should be consulted as a guideline. Foot Injury Mild Up to £10,450 Pain and temporary damage to the foot. Foot Injury Moderate £10,450 to £19,000 One or both feet lost normal functional capabilities. Foot Injury Severe £31,900 to £53,200 Amputation of one or both feet. Knee Injury Moderate Up to £19,900 Pain and long-term damage to knees. Knee Injury Severe £19,900 to £73,125 Loss of function in one or both knees. Leg Injury Moderate £21,100 to £29,800 Loss of function in one or both legs. Leg Injury Severe £73,150 to £103,250 Amputation of one or both legs. Hand Injury Minor £700 to £3,300 Temporary loss of functions in both hands. Hand Injury Moderate £4,100 to £10,100 Reduced hands functions. Hand Injury Severe £22,050 to £47,050 Amputation of one or both arms. Head Injury Minor £1,675 to £9,700 Superficial or external head injuries with no damage to the brain. Head Injury Moderate £32,725 to £166,500 Where substantial brain damage has altered mental faculties and behavioural changes are noticeable. While the above table can provide a useful estimation, your case might be slightly different. For a more accurate estimate, call our offices and arrange for a consultation session with one of our experts. Taking the first steps after a restaurant accident or illness might seem tough. Even trying to figure out where to start can be difficult. If you’re interested in claiming compensation, however, there’s an excellent way in which you can make the whole process much easier. We always recommend that potential claimants discuss the matter with a law firm. Once you have gathered the initial evidence, as outlined in an above section, you can take this information to a law firm and they can inform you as to whether you have a viable case. For example, we’re able to offer clients a free legal consultation session. In this session, we can chat about the details of your case and examine the evidence. If we think you have a good claim for compensation, we can offer you a ‘No Win No Fee’ agreement and an appointment with a local doctor. If you choose to work alongside our team, we’ll then take over the case, handling the administrative side of the claim and using our experience to make the whole process much easier. If you’re recovering from a major health issue, this can be invaluable. We are uniquely positioned to offer a range of services. This can make the difference between winning and losing a case. For example, we can arrange for an independent medical examination when required. We can begin by providing a free consultation session over the phone to save you the trouble of visiting our offices. Generally, this phone consultation proves very helpful for accident victims beginning a compensation claims process. With our legal expertise and years of experience in personal injury cases, we know how to put the client at ease while preparing a tough case. Armed with an independent medical opinion and our understanding of the personal injury law, we will be able to provide the best advice on the legal process. When you want an ethical, experienced, and expert law firm to maximise your compensation claim, we’re the best option available. If you have been a recent victim of a restaurant accident or illness, do not hesitate to call us for expert guidance and advice. When you have suffered physical and financial damages, we are here to help you fight your battle for compensation. You can use the chat function on our website, the contact form we provide, or you can call 0800 073 8804 to get your free legal consultation right now. We’re ready to help you with your compensation claim. How Much Compensation For a Slip Trip or Fall Personal Injury Claim? If you have had a slip trip or fall in a restaurant contact us today and find out if you can claim compensation for your injuries. If you have slipped on a wet floor in a restaurant and want to claim compensation contact us today for free legal advice. Burn Injury Claims – Compensation Amounts. Have you been burned in a restaurant? Find out how much compensation you could claim for restaurant burn injuries. This HSE link has information on how to comply with health and safety law on commercial kitchens, hotels, restaurants, cafes and more. Food hygiene/food safety standards are overseen by the Food Standards Agency and not HSE. Please read to find out more.